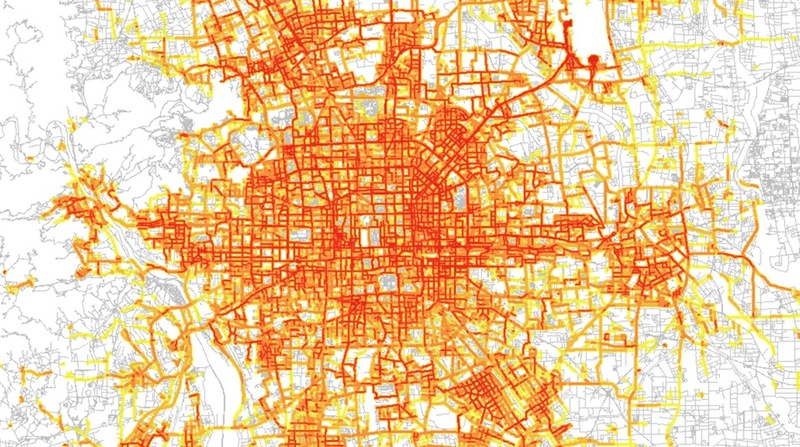 A road heat map from Didi’s big data traffic platform. 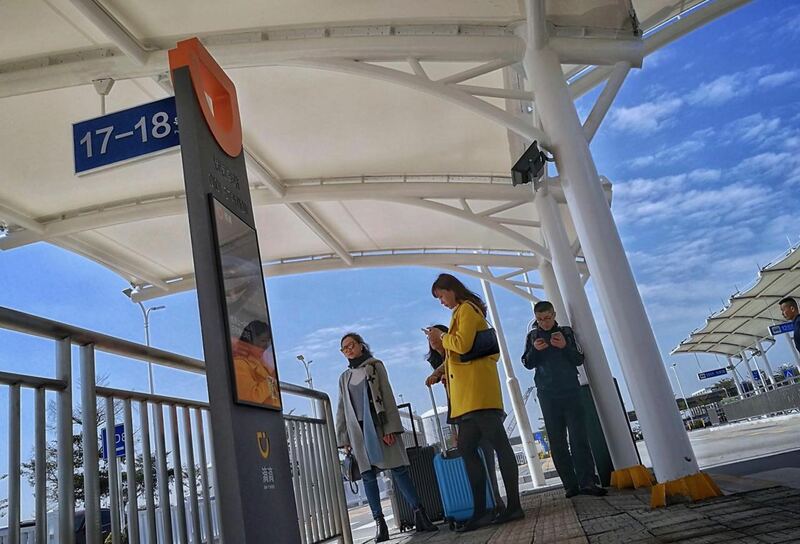 Photo credit: Didi Chuxing, modified by Tech in Asia. The security at Didi Chuxing’s headquarters is surprisingly tight for a ride-hailing company. Every visitor going in and out of its Beijing office – an enormous block of blue-tinted glass – has to register their name, contact and work information, take a selfie, and be accompanied by office personnel. The security guards are vigilant, stopping me at entrances to check for my visitor’s pass. “We’re paying more attention to data security,” explains one of the PR spokespeople. The company is placing increasing importance on data integrity, even conducting mandatory workshops for staff, she says. Didi Chuxing, China’s largest ride-hailing company, has virtually no competitors left in the domestic ride-hailing industry. According to CNIT Research figures from Q3 2016, the Beijing-based company controls 94.6 percent of the market. Launched in 2012, Didi’s taxi-hailing business has evolved to include car rentals, shuttles, private cars, and other kinds of transportation services. It’s also raised a dizzying amount of capital from big investors such as Alibaba, Foxconn, and Apple – and just announced another US$5.5 billion dollars in funding this week. In 2015, the company merged with its then largest domestic rival, Kuaidi Dache, bringing together respective investors Tencent and Alibaba after a vicious price war. Last year, it acquired archrival Uber China, in a deal worth US$35 billion. Having all but conquered the domestic market, the Beijing-based unicorn is now turning its focus inward, towards the terabytes of data generated through its app everyday. If the driver is nodding off, we want to know. In a meeting on Tuesday with media, Wensong revealed that Didi is developing a “safe driving system” – essentially a camera that monitors the road in front of and behind the car while recording GPS information. It’s meant to supplement Didi’s already massive volume of traffic data, which includes more than 20 million rides daily in over 400 cities in China. In comparison, Uber was reported to have 40 million monthly riders worldwide as of last October. The finer-grain image data will match road conditions with driver behavior, so that drivers aren’t penalized for erratic driving – like swerving or a sudden U-turn – if it’s situational. According to Didi, 200 units are currently out on the roads being tested. “The one facing forward will be used to check the road lane – is the driver following the lane or zigzagging back and forth?” explains Wensong. The camera can also detect sudden breaking, and check the distance between cars. “Drivers can’t be too close to the car in front of them,” he adds. Additionally, Didi’s new device could potentially collect a wealth of data about driver behavior. Wensong says that the company is working on “human action recognition,” which could be used to identify signs of fatigue in drivers, though a company spokesperson later told Tech in Asia that Didi is currently not recording anything that happens inside the vehicle. Passengers wait by a designated lane for ride-sharing services at Shenzhen Bao’an Airport. Photo credit: Didi Chuxing. Didi’s move to develop its own monitoring device is part of a larger push to analyze as much data as it can about transportation in China. Starting last year, the company has been tracking GPS information from drivers’ smartphones in an effort to curb speeding, sudden acceleration, and other risky behavior. In March 2016, the company released information about its “Great Tidal Strategy,” which uses the app’s mammoth trove of data and big data analytics to mitigate car jams and predict traffic hotspots. Traffic incidents, for instance, can be inferred in real-time based on the sudden slowdown of cars on a road. Temporary obstructions – such as construction sites – can also be detected when drivers choose to take detours instead of the fastest route possible when driving in a certain area. “If our original route is estimated to take 30 minutes to complete but drivers finish in 20 minutes, then we’ll take a look to find the cause,” says Wensong. Sometimes, that means that drivers know about a road that isn’t in Didi’s path planning system. “If this road doesn’t appear on our map, yet many drivers have passed through it, we’ll very quickly know that there’s a new path [to add],” he says. Traffic incidents can be inferred in real-time based on the sudden slowdown of cars on a road. The company has also started supplementing its platform by partnering with third-party sources, such as metro operators, public buses, and other public transportation services. It’s partly to improve the quality of Didi’s data, but it’s also an essential piece to another ongoing project: adding modes of public transport into its routing and path planning system. Already, public buses and their routes are tracked via the app. “In cities with dense populations, we prefer public transportation over cars, as there won’t be enough roads,” says Wensong. If the closest metro stop is 3 to 5 kilometers away, for instance, users can first hail a car, then ride the subway, before renting a bike to their final destination. This week, the company announced the integration of Ofo’s bike-sharing service into its app (Didi is Ofo’s investor). Similar to its traffic prediction and tracking analytics, Didi could someday estimate the crowdedness of the metro and help users plan accordingly. 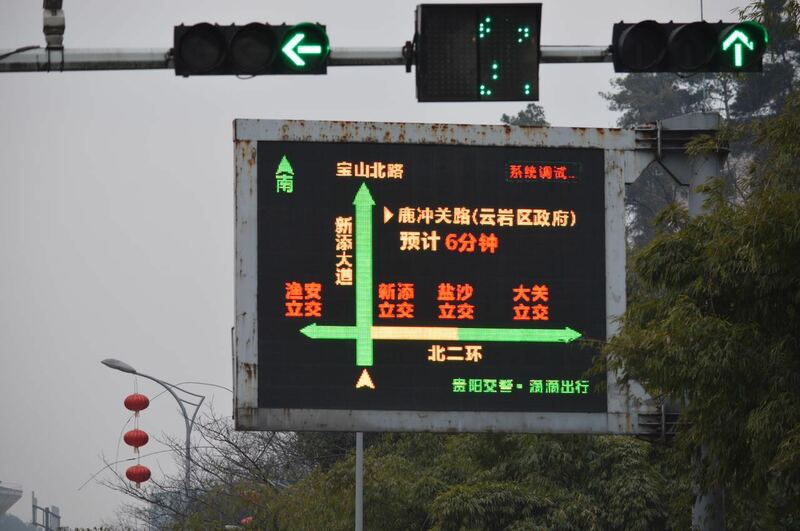 In Guiyang, there are LED displays that use Didi’s data to show real-time traffic conditions. Photo credit: Didi Chuxing. Scrutinizing traffic patterns and data mining makes business sense – it lets you optimize routes, avoid accidents, and complete more orders. Uber does it too. It uses smartphone data to track how fast its drivers are going in the US, for instance. But the Beijing-based company’s big data analytics system also serves another purpose. It opens doors for collaborating with local city governments – crucial in the context of tightening regulations, which have put brakes on Didi’s growing workforce, currently numbered at more than 17.5 million, excluding taxi drivers. Didi might have data and technology, but they need support from the government. According to Wensong, Didi’s quarterly traffic reports, the first of which was released this week, will mainly target government officials. The reports themselves are pretty vanilla – they rank cities by traffic and show basic trends about places and times when car jams are at their worst. The point is to give officials a taste of Didi’s capabilities so that they’ll want more, ultimately reaching out to the company for access to its big data platform. The company is also building a public “experience center” in Beijing to showcase its big data capabilities to government officials, as well as students and media. Didi’s traffic dashboard shows real-time Travel Time Indices of different cities, which compares travel time during and outside of rush hour. Photo credit: Didi Chuxing. 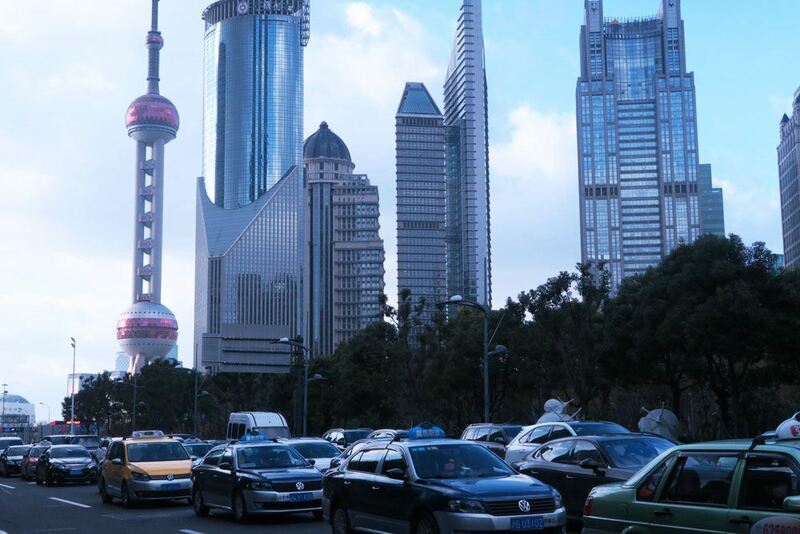 Currently, Didi is working with local traffic police in 11 Chinese cities, including Shenzhen and Jinan, the capital of China’s northeastern Shandong province. In Shenzhen, the company is helping local police catch drunk drivers by creating heat maps of daijia – Didi’s designated driver service for users who are too drunk to drive their cars home. In Shenzhen, the company is helping local police catch drunk drivers. In Jinan, Didi says it has helped decrease traffic delays during rush hour on Jingshi Road by about 10 percent. The company had to work closely with Jinan’s traffic police, toggling with traffic lights to improve traffic flow. However, the result could be even better – maybe even 20 to 25 percent – if Didi can expand the scope of its data, he says. Only 3 to 8 percent of Jinan cars are part of Didi’s platform, which means Wensong’s team isn’t getting the most accurate picture of the city’s road conditions, like how fast cars are moving or where bottlenecks occur. “If Jinan’s traffic police gives us data from intersections in real time, we can estimate how many cars pass through,” says Wensong. The stretch of road that Didi worked on for the Jinan project only included six traffic lights. It wasn’t a huge area, he says. But if their scope grew, they would have more control over the flow of traffic. “We could then guarantee normal [traffic] for an entire district,” he says. Rush hour in Shanghai. Photo credit: Tech in Asia. Didi says that all their data is anonymized on the platform – you can only see garbled up strings as IDs for drivers. But with cameras now scraping image data from around Didi-affiliated cars, plus the addition of public transport data, the company will become increasingly responsible for large volumes of user and citizen information – and their privacy. In addition to big data, Didi is also investing in artificial intelligence, specifically security and autonomous driving. In March, Didi opened its own artificial intelligence lab in Mountain View, California. As Didi continues to make moves overseas in markets like Brazil and Southeast Asia, it’ll have an eye not only China’s transportation market, but perhaps the world.